The man who knew the most about author self-portraits was Burt Britton, an avid book collector who founded Books & Co - an iconic bookshop in New York that operated from 1977 to 1997. 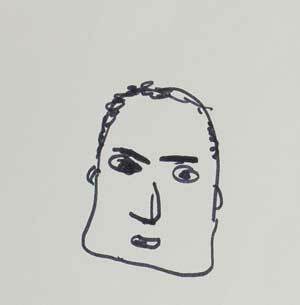 Britton requested and received self-portraits by authors but also musicians, sports stars and other well-known people. 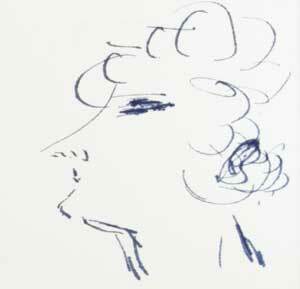 Britton's first self-portrait was provided by author Norman Mailer whom he met while working as a bartender at Village Vanguard in New York. Random House eventually published Britton's amazing collection of hundreds of self-portraits in a book called Self-Portrait: Book People Picture Themselves. Woody Allen, Margaret Atwood, James Baldwin, Anthony Burgess, Truman Capote, Roald Dahl, Don DeLillo, Joan Didion, Edward Gorey, Joseph Heller, Toni Morrison, Philip Roth and Paul Theroux are just handful of the people to have supplied self-portraits that appear in the book. Another book featuring author self-portraits is Who's Writing This? Notations on the Authorial I With Self-Portraits by Daniel Halpern, which contains numerous text and drawings from writers as they consider themselves. Jim Harrison, Edna O'Brien, James Salter and Susan Sontag are among the contributors. 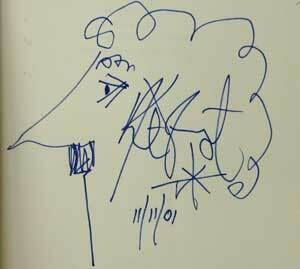 Vonnegut (1922-2007) was a generous signer and often added a sketch, usually a self-portrait. This signed 1969 first edition of Slaughterhouse Five is a typical example. 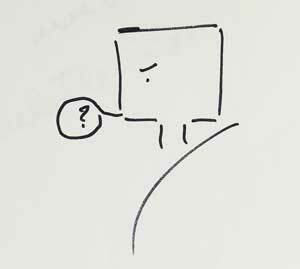 Vonnegut added this sketch on 11 November 2001. With curly hair, a generous moustache and a nose of some significance, Vonnegut's selfie is instantly recognizable. 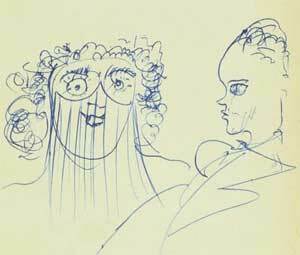 Vonnegut's sketches became so well known that his publisher used one on the cover art of A Man Without a Country. A generous signer, Updike (1932-2009) added this somber but surprisingly detailed self-portrait to this 1977 Franklin Library edition of Rabbit, Run. 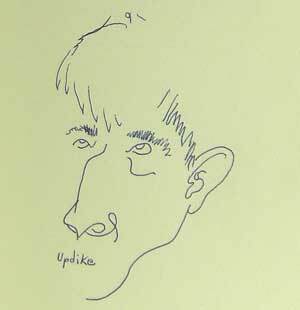 Updike's art skills are not surprise - he spent a year at the Ruskin School of Drawing and Fine Art at the University of Oxford and originally wanted to become a cartoonist. This copy of Waugh's Scott-King's Modern Europe contains a sketch of a woman with curly hair and what appears to be a self-portrait of the author best known for Brideshead Revisited. Scott-King's Modern Europe is a novella published in 1947. This is copy is inscribed to Anthony Powell (1905-2000), author of A Dance to the Music of Time. Waugh and Powell first met at Oxford University where they both studied. American Calvin Trillin (1935-present) is a writer of many skills - novelist, poet, essayist, food writer, and journalist. 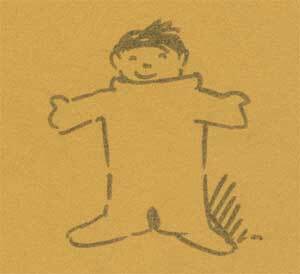 On this piece of notebook paper, dated 28 May 1974, he drew a self-portrait at the request of collector Burt Britton. Trillin is best known for his non-fiction, which usually addresses family, food and travel. Alice, Let's Eat and Travels With Alice are both highly recommended. This edition of Les Cahiers contains a self-portrait in ink by Sidonie-Gabrielle Colette (1873-1954), who is best known for her novella, Gigi, about a 16-year-old courtesan who marries her lover. She was also a mime, an actress and a journalist, and usually just called "Colette." Sendak (1928-2012) inscribed this copy of In the Night Kitchen to collector Burt Britton and added a self-portrait showing himself as the book's main character, Mickey. Sendak, a talented illustrator, often added sketches when signing books. This copy is dated December 1970, the year In the Night Kitchen was published. Drabble's self-portrait is rather severe, perhaps fitting for someone who has feuded with her novelist sister AS Byatt for many years. Dame Margaret Drabble (1939-present) is best known for novels on English society such as The Millstone and A Summer Bird-Cage. 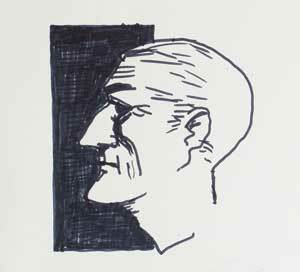 Gill (1914-1997), who was a critic with The New Yorker magazine for more than 60 years, produced a remarkably detailed self-portrait for Burt Britton on 7 July 1974. Gill wrote more than 1,200 articles for The New Yorker. 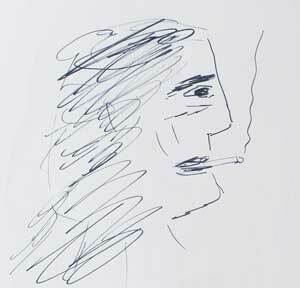 Naturally American author Gay Talese (1932-present) is smoking in this self-portrait from 1973. Galese is a renowned smoker and lover of Cuban cigars. 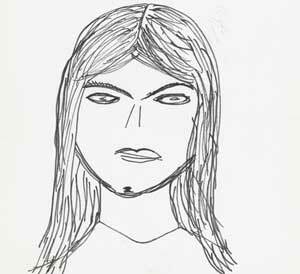 This sketch is dated 30 June 1973. Talese is a master of literary journalist and worked for the New York Times and Esquire to help define this style of writing in the 1960s. In 2006, he published a memoir called A Writer's Life. Robinson (1872-1944) was an English cartoonist and illustrator best known for drawing complicated machinery, rather similar to Rube Goldberg's machines in the US. Bill the Minder is a children's story, published in 1912, where Bill creates fantastical machines to solve various problems. 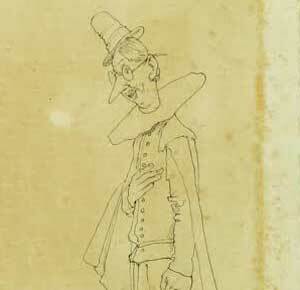 This self-portrait, dated 1912, shows Robinson in costume, perhaps medieval garb. Rackham (1867-1939) was one of the greatest book illustrators to ever lift a paintbrush and his artwork is loved by collectors. Peter Pan, Alice in Wonderland, Gulliver's Travels, and A Christmas Carol are just a handful of the titles that he illustrated. 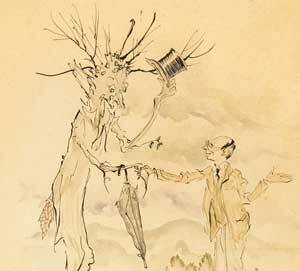 This charming self-portrait, where Rackham is greeting a tree, is pen and ink and watercolor on rag paper. Tomkins (1925-present) knows the art world well from his decades of covering art for the New Yorker magazine. His books have covered artists such as Marcel Duchamp and Robert Rauschenberg. This self-portrait appears to come from the Cubism school of art. Tomkins chronicled art in New York during the 1960s and 1970s where he saw the rise of Pop Art and abstract art. He has written several books on the conceptual artist Marcel Duchamp. Another generous signer, Gaiman (1960-present) - famous for American Gods, Anansi Boys and Coraline - added a full-page self-portrait to this copy of Absolute Sandman. Gaiman's early writing career was in comics but he collaborated with several notable artists such as Mark Buckingham and Dave McKean. 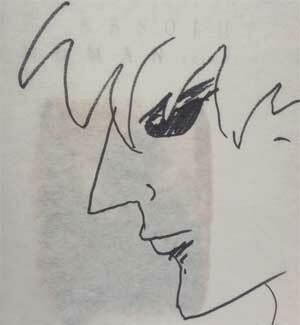 Gaiman is one of the four most prolific modern signers along with Salman Rushdie, Ken Follett and David Sedaris. Whose self-portrait would you like to own?